I thought my roundup of Thanksgiving recipes was complete until I whipped up this tasty number for Taylor and me last night. This is one of those simple recipes that packs in so much flavor that it’s hard to believe how basic it is. There’s nothing I love more than a sweet, salty and crunchy salad and this one is top notch. 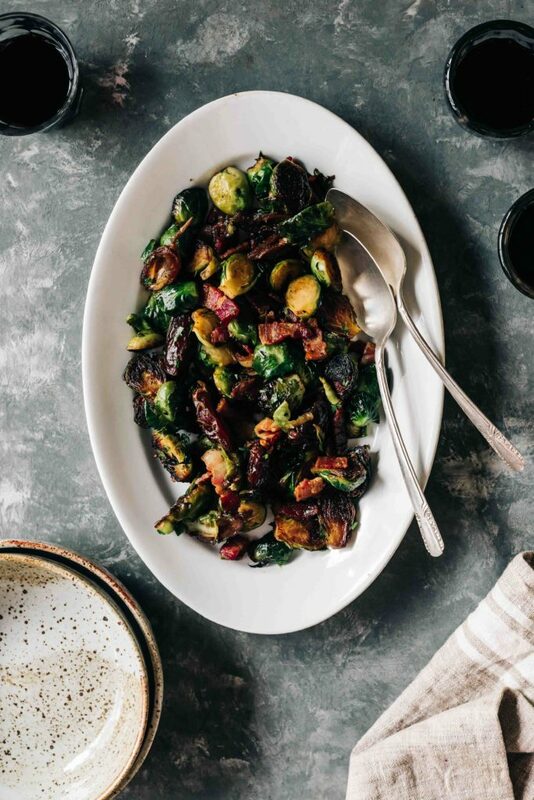 The brussels sprouts are cooked in bacon fat until charred and then they simmer in a little broth with the dates. The dates themselves become almost caramel-like and melt in your mouth. I think this recipe will definitely be making an appearance at our Thanksgiving table and I hope you all enjoy it as much as we do. Don’t forget to grate in a little lemon zest for added punch. It really ties this whole dish together! Heat a large cast-iron frying pan over medium-high heat, and cook the bacon with the olive oil until browned but still juicy, about 7 minutes. Transfer the bacon to a paper towel-lined plate and set aside. Reserve the bacon grease in the pan. Increase the temperature to high and add the brussels sprouts, cut side down to the pan. Cook, without disturbing the sprouts for about 5 minutes. You want them to blacken up quite a bit. Flip the sprouts and cook for another 2 minutes. Season with salt and pepper. Add the dates and the reserved bacon to the pan. Pour in the stock and bring to a boil. Reduce heat to low and simmer until most of the sauce has reduced by half. Occasionally use the back of a spoon to press down on the dates, breaking them into smaller pieces as they soften up. Sprinkle in the freshly grated lemon zest and parsley. What a delicious side dish! Sounds yummy! This sounds delicious! I usually do bacon, cranberries, winter squash, nuts, and maple syrup with my Brussels sprouts. Dates are an incredible idea! This is now my favorite Brussel sprouts recipe! Goodness!! So easy and so unbelievably delish!! Thank you for your crazy good and simple recipes!! 5 out of 5 stars! The only thing I will recommend is to buy bacon that is nitrate and preservative free.